Oak View resident interrupts burglary of her residence and assists with identification of suspect, which led to his arrest. On 03/06/19, at about 1230 hours, a 71-year-old victim returned home from her day’s activities to find unknown an intruder, later identified as James Hanna, had ransacked her residence, and was still inside her bedroom rummaging through her personal belongings. After announcing to Hanna that she had a gun, Hanna decided it was time to leave and ran out the garage door. The victim saw Hanna was carrying two duffle bags full of what she believed to be her personal items, as he fled towards his car parked in front of her residence. The victim decided she wasn’t going to just stand by and allow Hanna to make off with her property, so she chased after him. As the Deputies began their investigation, they contacted Ojai Detectives who were already out in the field on an unrelated matter. Thanks to the Ventura County Sheriff’s Office keeping up on the most recent technology, the Detectives were able to immediately go to work on the partial license plate of “L.U.C.” provided by Kenton and identified their suspect as “James Hanna,” who lived nearby and was on parole for grand theft. Information was developed that indicated Hanna had fled to the Santa Barbara area. 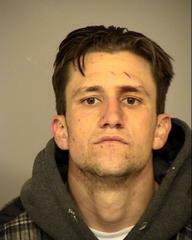 Hanna was ultimately located and arrested in Santa Barbara County. After continued collaboration with the California Highway Patrol and the Santa Barbara County Sheriff’s Office, Ojai Deputies responded to Santa Barbara and arrested Hanna for 211 PC – Robbery and 459 PC – Burglary. Although victim’s actions proved beneficial, the Sheriff’s Office does not want to encourage anyone to put themselves in harm’s way during criminal activity, please call 911 immediately.